The parish chest which was rediscovered locally, is dated 1724, is made of solid pine. Originally it would have been stained with egg yolks, which would have left the chest a dark nearly black finish, (almost resembling ebony). 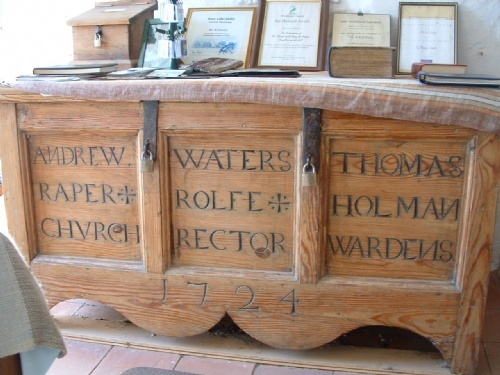 The chest has two hefty locks on the outside, and is inscribed with the name of two church wardens, Andrew Raper and Thomas Holman, and the parish Rector who at the time, was Waters Rolfe, the smaller chest on the inside which would have contained the valuable silver and parish records etc has three locks. Reverend Rolfe was born in 1668 and died in 1754. He graduated from Caius College Cambridge was ordained and appointed to the Rectory of North Pickenham and Houghton-on-the-Hill in 1719, where he remained until 1747. His son Robert Rolfe was also a Fellow at Caius College Cambridge and went on to become Rector at Hillborough from 1756 to 1785. Alice Blande was the daughter of Lord Nelsons Aunt, making her his first cousin.